In 1988, Mack Brown arrived as the head coach of the UNC Tar Heels and found a team devoid of talent and lacking a solid quarterback under center. The ’88 Tar Heels finished 1-10 and saw three different players take snaps at quarterback. Jonathan Hall, Todd Burnett and Deems May all saw time at the position, but combined to finish with seven touchdowns and 16 interceptions. Brown would eventually turn things around in Chapel Hill, but his first year saw the Heels struggle mightily at quarterback. This year, Brown enters a similar situation in his second go-around as head coach of the Tar Heels. Over the past two seasons, six different players have taken snaps at quarterback (not counting players who attempt a pass on a trick play) for UNC. None of those players have solidified themselves at the position and quarterback continues to be one of the biggest questions on the roster heading into Brown’s first season back at Carolina. Of those six, two will not be on the roster in 2018 (Brandon Harris and Manny Miles). Due to a combination of injuries and suspensions to other players, Elliott has taken the majority of snaps for UNC over the past two years. The senior improved on his accuracy last year (51.4 percent to 61.8 percent), but struggled with interceptions. All nine of his interceptions came in three games, including four in the Tar Heels’ opener against California. Surratt split time with Elliott in 2017, but was suspended for the first four games of last season due to NCAA violations for selling team-issued sneakers. In his first game back for the Tar Heels against Miami, he tossed three interceptions and injured his wrist on his non-throwing hand. He did not play in another game in 2018. Meanwhile, Fortin and Ruder both saw playing time as freshmen last season but both battled injuries as well. Fortin started for Carolina against Virginia Tech, but left that game with an injury, while Ruder played against Georgia Tech and also left with an injury. 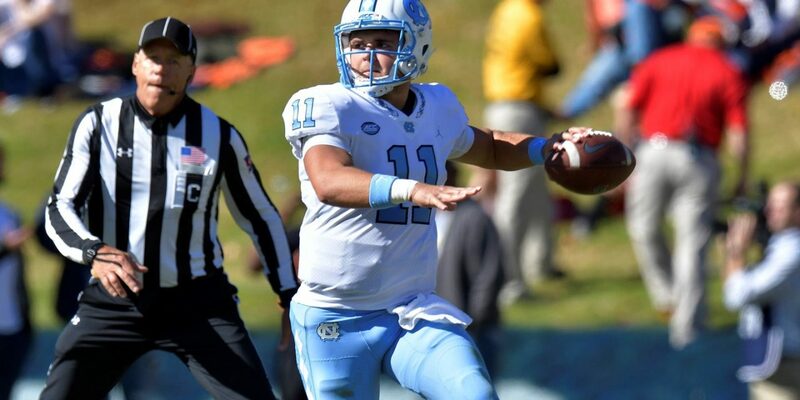 Fortin ended up starting the Tar Heels’ season finale against NC State, which could mean that the young signal-caller is healthy for offseason workouts. Due to the new NCAA eligibility rules, it is also likely that both Fortin and Ruder will be classified as redshirt freshmen next year seeing as they both participated in fewer than five games. So what does this mean for Mack Brown and his quarterback problem? With the news that former Clemson quarterback Kelly Bryant is transferring to Missouri and not North Carolina, the 2019 starting quarterback for UNC is likely one of the four players listed above. Elliott is the most proven option, but might have a much lower ceiling as compared to Fortin or Ruder. Meanwhile, Surratt provides a dual-threat option to UNC’s offense. Look no further than Vince Young’s national championship season in 2005 to see what Brown can do with a talented running quarterback. Of course, this is no guarantee that UNC’s long-term answer at quarterback is a player currently on the roster. While Brown played Hall, Burnett and May in 1988, it wasn’t until Jason Stanicek came along in 1991 that the Tar Heels found a four-year starter. Stanicek’s four seasons at North Carolina saw the team finish 34-14 overall. The Tar Heels do not have a quarterback committed for the Class of 2019, but have been connected to four-star Florida State commit Sam Howell. Howell, a Charlotte native, took an official visit to UNC earlier this season and told the Charlotte Observer that he is undecided about signing early with the Seminoles. Brown’s five-year contract at Carolina means there is not immediate pressure, but the newest member of the College Football Hall of Fame has stated that the goal is to win next season. “We’re not trying to start over. We want to win now,” Brown told reporters at his introductory press conference in Kenan Stadium. For now, that means playing Elliott, Surratt, Fortin and Ruder. But the next great Carolina quarterback might be a yet-to-be-discovered recruit hiding in the Tar Heels’ backyard. Nice story. One correction – Vince Young didn’t win the Heisman. The 2005 did win the national championship in one of the greatest games ever played, so he’ll probably settle for that.